Trans: 6-Speed Automatic -inc: SelectShift w/997, Requires valid FIN code. Serviced here at Galpin, Originally Sold at Galpin, NEARLY New VEHICLE AT USED Car PRICE Superb Condition. Serviced here at Galpin, Originally Sold at Galpin, NEARLY New Car AT USED Car PRICE, newCarTestDrive.com explains "The shapely front seats are supportive and well-bolstered. There's good front headroom and legroom, while tall doors help make entry and exit easy. Forward visibility is excellent, thanks to a high driver's seat, abundant glass, and narrow roof pillars.". 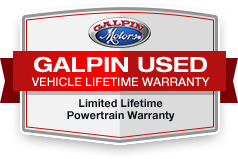 This pre-owned vehicle comes with Galpin's Limited Lifetime Used Car Warranty. It's a Powerlife Powertrain Warranty that covers you for as long as you own this vehicle. (1) In addition, it has gone through and passed Galpin's 176 point inspection. We also offer a 3-day money back guarantee so if for whatever reason you want to bring it back, you can. (2) For peace of mind, Galpin runs 3 vehicle history reports for you to review once at Galpin. 1) Limited Lifetime Powertrain Warranty is non-transferable. Terms and conditions apply. Must perform Manufacturer recommended maintenance and have oil and filter change completed at a minimum of every six months or 7,500 miles, whichever comes first. All services must be performed at a licensed repair facility. Eligible vehicle must be 2007 or newer and have less than 100,000 miles at the time of sale. Excludes vehicles covered under a manufacturer certified pre-owned (CPO) program warranty. Excludes Lease Buyouts. Additional exclusions apply. Offer valid through close of business December 31, 2018. This Fusion is One of our Ford Courtesy Vehicles. These are Low mileage used vehicles that are eligible for New Vehicle Retail Incentive Offers and the balance of the New Vehicle Limited Warranty. These vehicles were formerly used by our customers and cared for by our very own service department. Save hundreds of dollars on your monthly payment when you buy One of our Ford Courtesy Vehicles and still enjoy that New Car smell! Call us today to see this barely used Fusion in person and experience 'Galpin Used Car Difference'. Used Dealer Rental Vehicle. All figures are EPA estimates. Actual mileage will vary. Kelly Blue Book values are calculated based on the current Retail Book. Pricing analysis performed on 2/26/2019. Please confirm the accuracy of the included equipment by calling us prior to purchase.